The guest of honor at many dinner tables on Christmas Day is a Beef Rib Roast (aka prime rib, standing rib roast, ribeye roast). Reverse seared boneless ribeye roast. 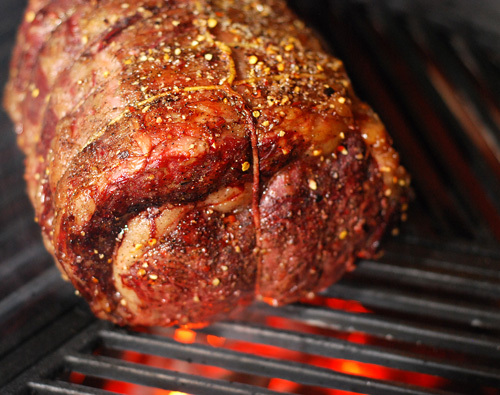 I put together this list of 20 tips for a perfect fire roasted beef rib roast. Some of them are ones I have learned by experience, some are from my favorite cooking resources. How big of a rib roast do you need? 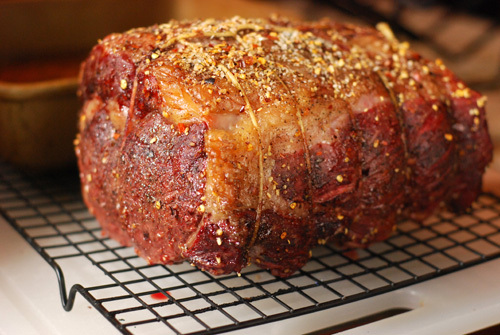 Estimate ¾ lb per person for a bone in rib roast or ½ lb per person for a boneless rib roast (Rouxbe). What grade of meat do you want? 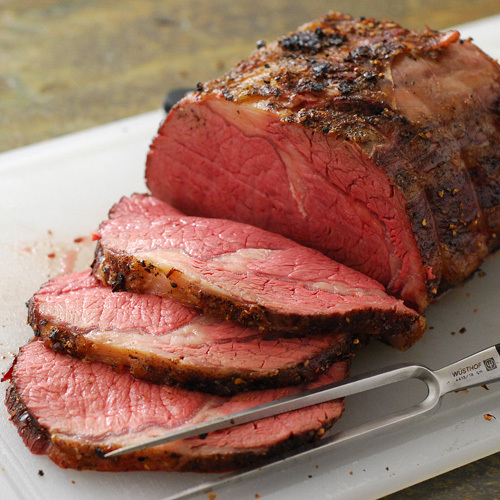 “Prime rib roast” does not designate that the meat is prime grade automatically, it’s just a name (Lilly 97). You will want to stay with either USDA Prime or Choice grades of beef. 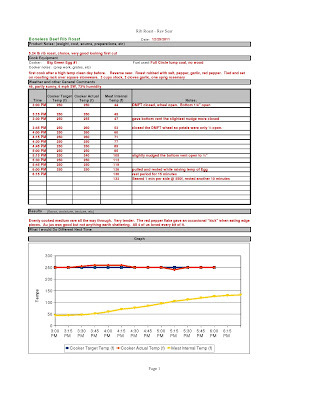 Avoid select grade if possible, it is too lean and can dry out. What do you want to look for? Look for a deep red color, nicely distributed marbling, and a nice thick fat cap (about 1/2”) on top of the roast. 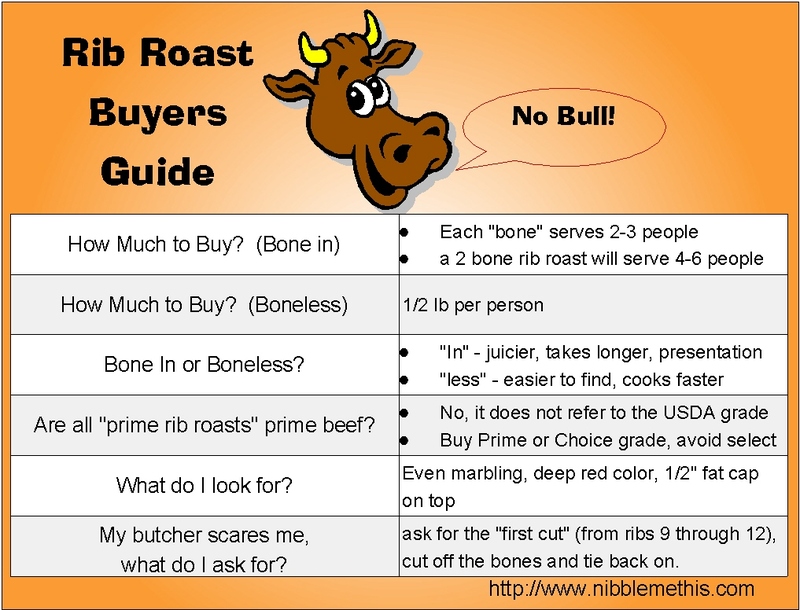 Do you want a bone in or boneless rib roast? It’s up to you. 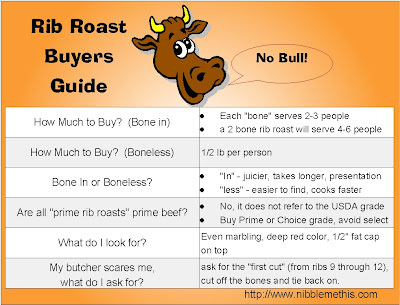 Generally, a boneless rib roast is easier to find in stupidmarkets, cooks faster, and is easier to carve. A bone in rib roast usually gives a juicier end product, makes a nicer presentation, but it takes a little longer to cook. What do you ask your butcher? Whether you are going boneless or bone in, tell your butcher that you want a roast from the “first cut” (aka short cut, loin cut). The entire roast is from ribs 6 through 12. The meat attached to ribs 9-12 (first cut) is more tender and contains the definitive rib eye (Becker 648). If you are getting bone in, ask your butcher to remove the rib bones and then retie them to the roast. This will make carving easier. A whole ribeye can easily be broken down into roasts and ribeye steaks. No bones about it. 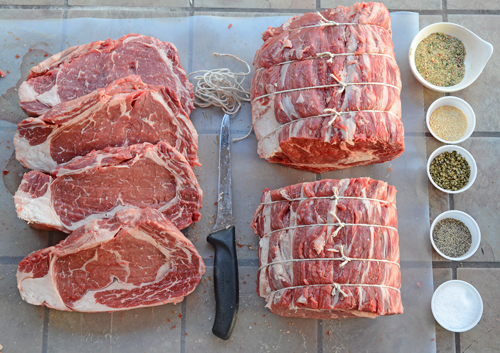 If using a boneless rib roast, it is important to tie the roast or have your butcher do it for you. This will give you a more compact shape that provides for more even cooking (Becker 648). 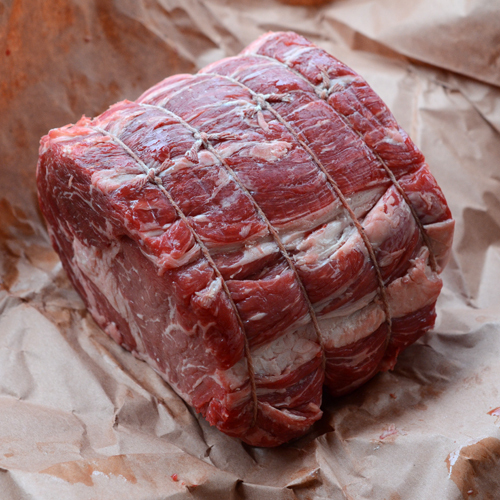 Remove any moisture from the roast's surface with a paper towel (moisture is the enemy of browning) (Rouxbe). Rack it up. Use a roasting pan with shallow sides, a heavy bottom, and just big enough to hold the roast (this keeps your drippings from evaporating away) (Becker 649). Raise the roast off of the pan using coarse chopped (1” pieces or bigger) root vegetables or use a roasting rack. You want to roast the meat, not braise it. 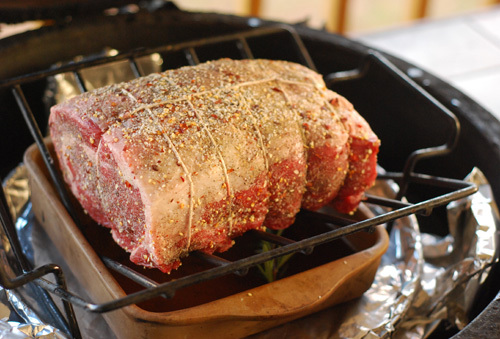 Tying the roast helps maintain its shape and facilitates more even cooking. I have 2 cups of broth, 2 garlic cloves and a sprig of rosemary in the drip pan. If you want a less smoky au jus, remove and reserve the liquid in the container after 45 minutes. Heat to a simmer for 5 minutes. Taste and add salt/pepper as needed. Direct heat method – Set up your grill for direct heat and preheat to 500f. Sear the meat for 2 minutes per side for the top and bottom. Sear the sides and ends for 30 seconds each. 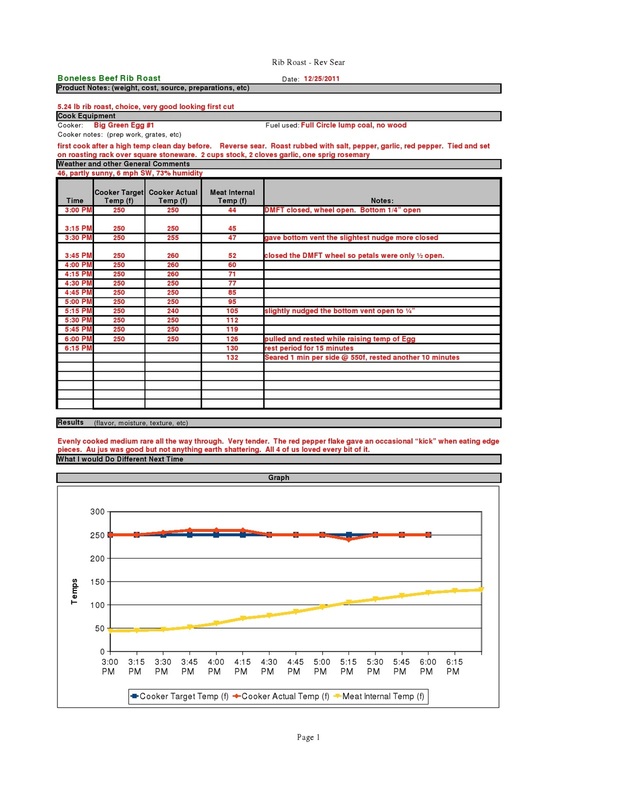 Indirect heat method – Set up your grill for INDIRECT heat and preheat to 450f. Roast until the meat begins to form a crust on the outside, about 20-30 minutes. For either of these two methods, after searing the meat, remove it from the grill (or oven) and reduce the heat to your roasting temperature (see next section). If you used the direct heat method, change your grill set up to indirect heat. Also add wood chunks at this point if you are using them. Reverse Sear method - This is the method I prefer for easy of cooking and quicker times since you don't have to wait for the Egg to cool down. Roast first (see next section), pull when the roast comes within 10 degrees of your target temperature and then sear over a very hot grill (500f or so). Read more about the Reverse Sear. TIP FOR REDUCING CHARCOAL GRILL TEMPS – Normally you reduce charcoal grill temps by slightly adjusting air flow. But in this case, you are trying to reduce your heat by up to 250 degrees and do it quickly. ADD MORE COAL. Yeah, I know that doesn't make sense. I got this tip from a class taught by Chris Lilly in May 2010 and I thought he had lost his mind. I finally tried it last night after my temps wouldn’t get down from 340f and it immediately knocked my Egg’s temp from 340 to 210. I guess it's the combination of adding cool mass to the fire and smothering it slightly at the same time. The sear doesn't take long, only about 45 seconds to 1 minute per side. Make sure to get all sides seared, including the ends. 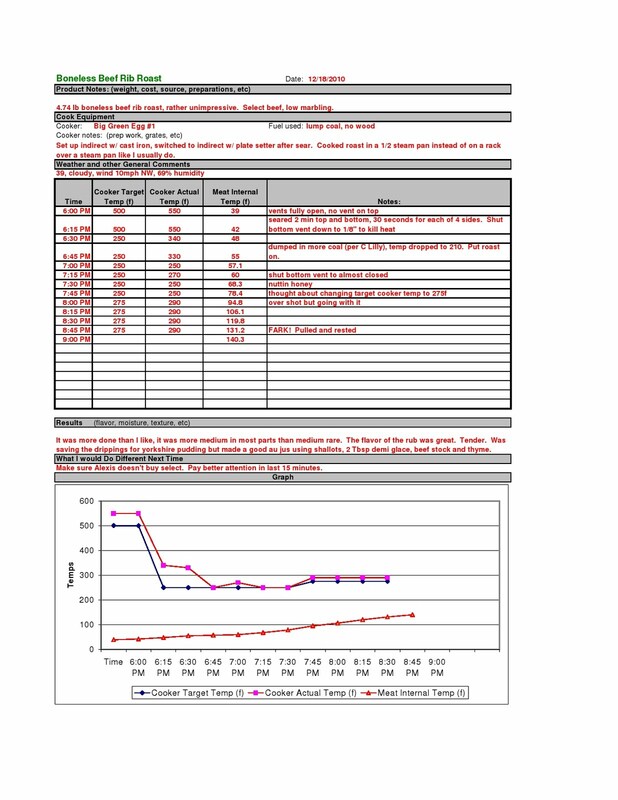 Set up your grill for indirect heat (click for info on how). Roast at 250f for a more evenly cooked and juicy rib roast. 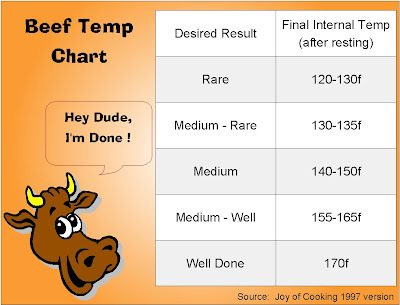 This is important for rare or medium-rare (Rouxbe). Roast at 350f if you want a quicker cooking time and a roast that has a varying degree of doneness (done on the outside, medium, then med rare at the center)(Rouxbe). 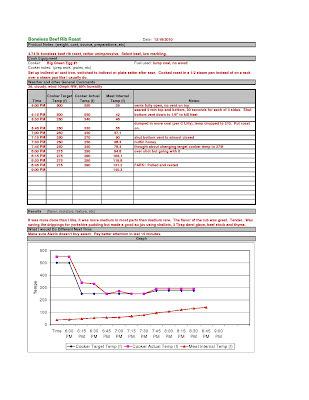 General rules of thumb such as so many lbs per pound or time & temp charts are ONLY an estimation. 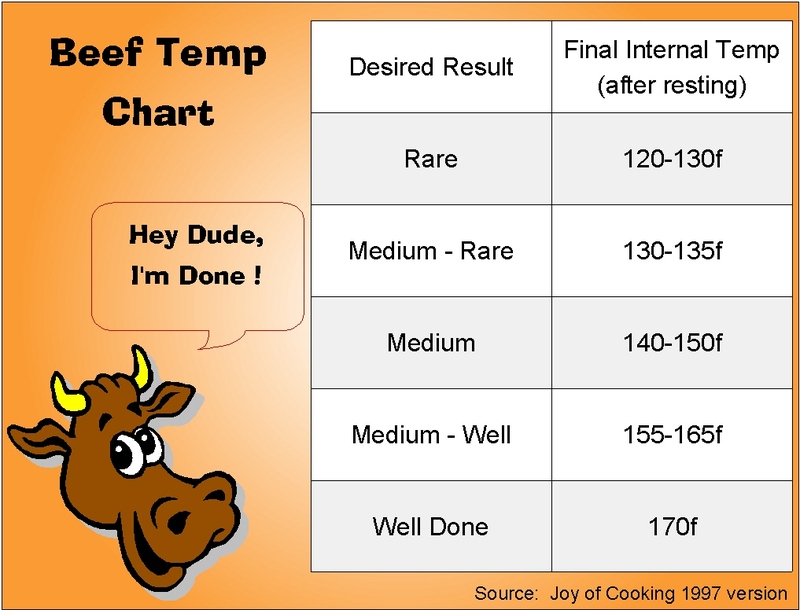 It is difficult to generalize when so many variables affect cooking time, such as; size/shape of the roast, bone/boneless, actual temperature of the cooker, and the internal temp of the roast when it began (Rouxbe). To get a properly cooked roast you must go by internal temps, so a fast instant read thermometer or remote probe thermometer is necessary. Warning – Once your roast gets up to an internal temperature of 100f, don’t turn your back on it for long. It can jump up in temperature very quickly so keep an eye on your temps. That’s how mine got over done to almost medium last night. Carry over cooking – Once you take your roast off, it will continue to rise in temp approximately 5 to 10 degrees more so you need to adjust what internal temp you are pulling off the roast. 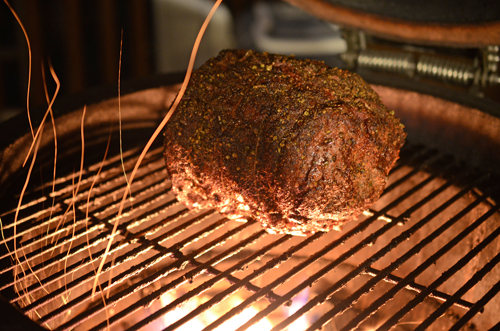 For example, I target medium rare (130 to 135f) so I pull my roast off when it hits 125f. Unless I screw up like mentioned above! 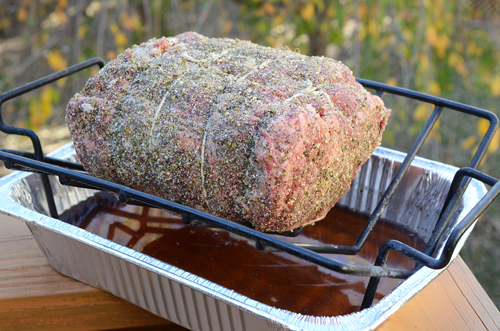 Rest your roast on a raised rack above a drip pan. Placing a roast on a flat surface will steam the surface of the meat, opening the pores, and allow the juices to flood out. For the same reason, don’t wrap the roast in foil, that will steam it. After 5-10 minutes on the cooling rack, you can loosely tent it with foil but tear a hole or two in the top of the foil. Let rest like this for at least 15 minutes but up to 1 hour, it will stay warm. The redistribution of the internal juices will also help an overcooked or undercooked roast to a certain extent. Flip the roast over half way through the resting period. This helps the redistribution. If you used a bone in roast, to carve it the first thing you do is slice off the rib bones. When no one is looking, steal them, brush them with some BBQ Sauce and toss them back on the grill for a little while. Keep them for yourself, absolutely delicious. Forget giving them to the dog, remember that time he threw up in your shoe or chewed up your newspaper? And here is one from a reverse sear cook (Click to enlarge for the detail).